This morning, Swiftkey introduced version 4.3 beta of its popular Android keyboard. This latest build is significant because it builds on Swiftkey cloud by finally merging the Swiftkey tablet and phone keyboards into one app, while also providing users with the power to resize and move keyboard layouts anywhere on a device. As you can imagine on a big screen, this feature could come in handy quite often. As Swiftkey suggests, there could be times when you are using a tablet and need to single-hand type, so a keyboard shrunken and moved to one side of the screen could be beneficial. At other times, you may want to use two-thumbs and type much quicker, so a spread out or traditional style keyboard may work best. The new beta is available for download as of right now. You’ll find a download link below. San Francisco, CA, October 17, 2013 — SwiftKey, the leading Android keyboard app, today announced public beta access to its latest version, dubbed ‘Layouts for Living’. The SwiftKey 4.3 update provides users with new keyboard layouts that can be resized and moved anywhere on a device, empowering people to type however they want to, regardless of screen size. Through extensive user experience (UX) testing and feedback, SwiftKey recognized that an increasing lack of distinction between the phone and tablet form factor means users are demanding more flexibility when they type. For example, commuters in cramped trains may want to type one-handed with their left thumb, while a professional writing a document on a tablet may want to type with both thumbs. SwiftKey’s latest update aims to adapt to everyday situations such as these as well as any number of others – it’s up to each user. 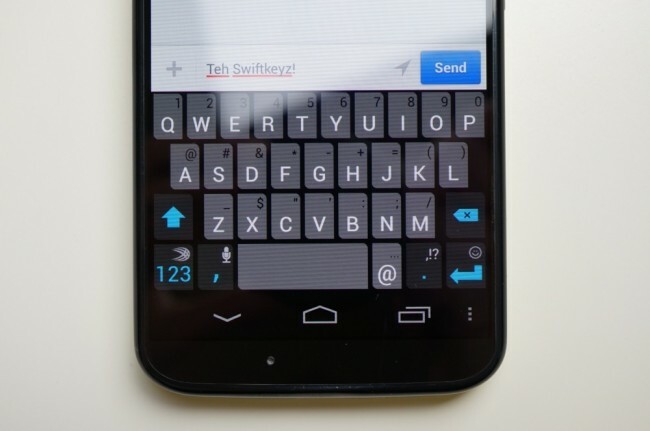 With Layouts for Living, SwiftKey liberates users with a huge variety of layouts. Compact: On many larger phones it can be difficult to enter text and hold the phone with just one hand. This new feature minimizes the width of the keyboard and allows for easier typing with one hand or gesture typing using SwiftKey Flow. It also frees up more of the screen estate on tablets. Full: Users with large screens can now opt for a full-width keyboard with left-right cursor control keys and a backspace key above the “Enter” key. By placing the keys closer together, this new layout mimics the experience of two-handed typing on a physical keyboard. Thumb: For people typing on tablets in landscape and with wide phones in portrait the keyboard can be split into two sections, enabling fast, comfortable typing with both thumbs. As devices of varying sizes continue to enter the market and the line between tablets and phones blur, a consistent SwiftKey experience is an ongoing priority for our fans. Responding to fan feedback, SwiftKey has merged the phone and tablet apps to give a seamless experience across all device sizes. With SwiftKey Layouts for Living, current and future customers can use one unified SwiftKey app across all Android devices. Leveraging SwiftKey Cloud, which was introduced in SwiftKey 4.2, the app also creates a cloud-based hub for each user’s personal language profile to be shared with any phone or device. SwiftKey Layouts for Living offers a beautiful user experience for all users, across all of their devices no matter the screen size. The SwiftKey Layouts for Living beta is available to the public now and can be downloaded at http://beta.swiftkey.net.